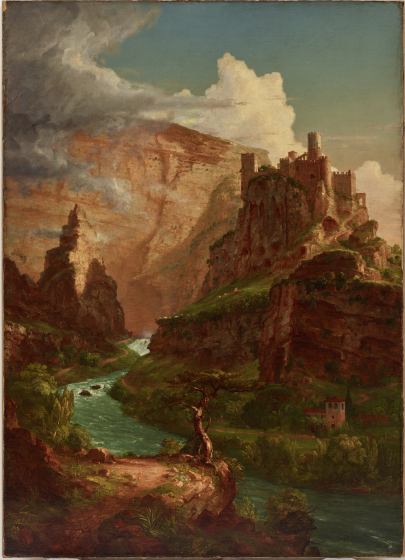 Thomas Cole, the founder of the Hudson River School, painted this on his second European journey in 1841. 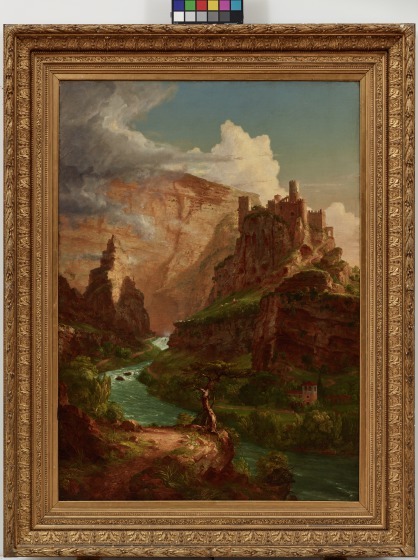 Best known for his spectacular, large-scale landscapes, Cole often incorporated literary, biblical, and historical themes into his paintings. On his way from Avignon to Rome, Cole traveled to Vaucluse to see the house of Petrarch, the 14th-century poet and scholar. Originally Cole included the poet, cloaked in a brilliant, red garment, standing on the illuminated, rocky outcrop in the foreground. 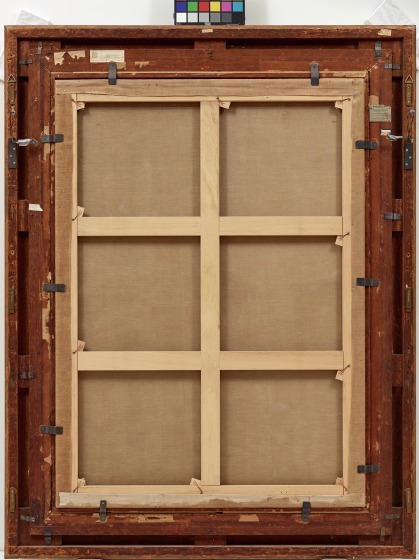 He painted Petrarch out, leaving only the imagined landscape of renaissance-era Vaucluse. Cole altered the actual landscape, compressing the steep sides of the ravine in order to achieve the desired effect of the Sublime, inspiring awe in his audience. The castle on the cliff was long ruined, but Cole painted it restored to its 14th-century glory. Eleanor Jones Harvey, label copy, n.d.
Bonnie Pitman, ed., Dallas Museum of Art: A Guide to the Collection (New Haven, CT: Yale University Press, 2012), 179. 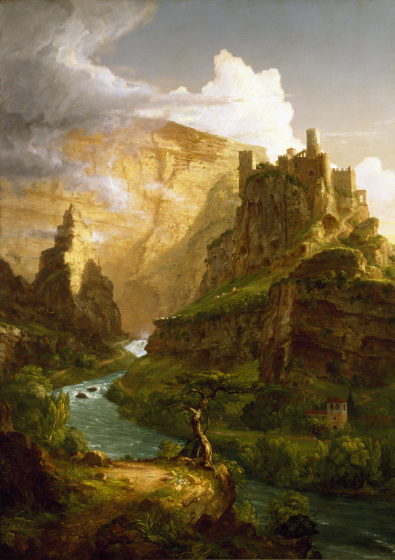 Cole’s star pupil, Frederic Edwin Church owned this painting. 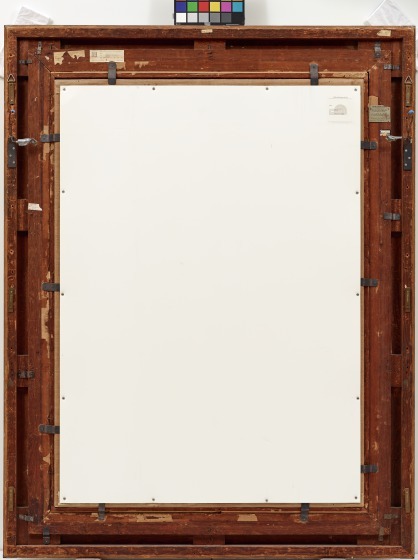 He sold it in 1882 to give the proceeds to Cole’s widow. 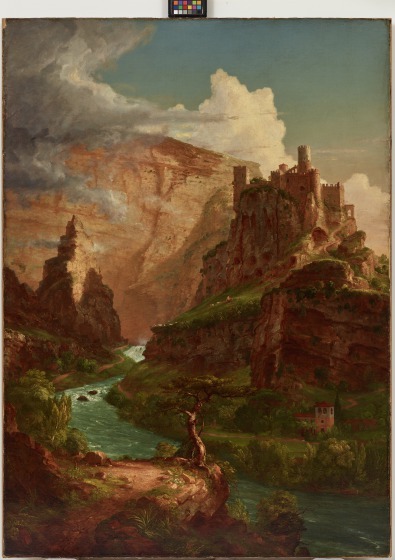 When he painted this, Cole was traveling with Ithiel Town, the architect of the Wadsworth Athenaeum in Hartford, CT, and the Federal Hall National Memorial in New York City. 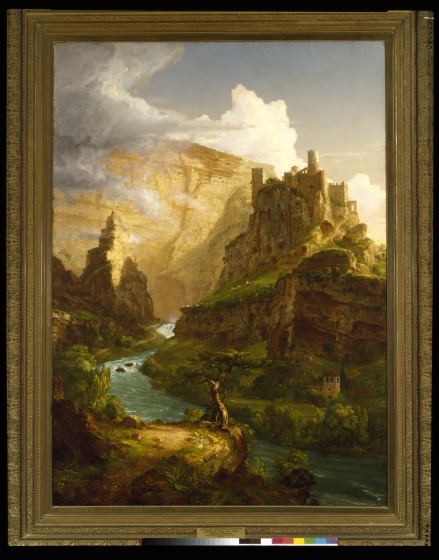 Experience this virtual exploration of Asher B. Durand's 1849 Kindred Spirits, created in honor of Thomas Cole who died the year before.